If you are attempting to evaluate the pricing for an online sports registration system you are probably finding a wide variety of pricing terms and perhaps feeling a bit overwhelmed and confused. Your total cost will include service provider charges applied across a wide set of parameters plus merchant charges for credit card clearing houses such as Paypal and Stripe. As such, determining the true cost differential between providers can be a challenging task. 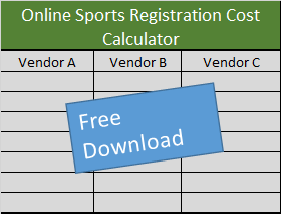 This blog, and the accompanying Online Sports Registration Cost Calculator serves as your guide for understanding the pricing practices for online sports management services. Youth sports participation statistics compiled since 2009 show significant losses and gains across a wide spectrum of sports. The best available data stems from a multi year tracking study done by the Sports and Fitness Industry Association from 2009 to 2014 which is presented and discussed herein. The following is a summary of some of the best youth sports data and participation resources. Youth sports is facing many internal and external issues and these reports and articles help tell the story. If you are researching youth sports statistics our list of youth sports data sources is great place to start. Today's headlines are filled with instances of youth sports coaches, board members and volunteers, committing crimes. The charges include sexual misconduct with players and parents, financial theft, equipment theft, battery and other crimes. Many youth sports organizations are turning to background checks to prevent criminal behavior before it happens. This post reveals the results of a nationwide survey of over 1,400 youth sports leaders and the degree to which background checks are being implemented, on which personnel and their perceived level of effectiveness. Bob Cook, a youth sports contributor for Forbes, penned a recent article, Why A Coach Is A CEO that Should Treat Parents As Shareholders, in which he suggests that youth sports coaches should act more like CEO’s focusing on shareholder return versus unaccountable tyrants. I believe Cook focuses too much on the shareholder concept and not the other traits of great CEOs which are more applicable to youth sports coaching. This article highlights traits of great CEOs which are also traits of great sports coaches.